Scottie Dad's been home for just under four hours. And, as I feared, he beat me home from work tonight. The last time he came home after being gone so long, it was accident after accident for Heather and one very upset Scottie Dad. I hoped from the bottom of my heart that his reappearance wouldn't alarm Heather so much this time around but, much to my dismay, there's been two accidents so far and the night isn't even over yet. Heather and Scottie Dad used to be best buds - up until the weekend she almost got away and he had to chase her down. They're still pretty close and adorable as ever together, but since that time, she is extra cautious around him, peeing when she gets too scared, too happy, too submissive and even when she's just overly excited around Scottie Dad. We're having trouble making sense of it all, really. Tonight, I came home from dinner with Scottie Dad to find my couch cushion completely soiled...Scottie Dad had just walked the pups three hours earlier (not to mention the wee accident she had on the way out the door)! It's literally been weeks since her last accident but then again, it's literally been weeks that Scottie Dad's been away. So, fellow Scottie Mom and Dad's, we turn to you. 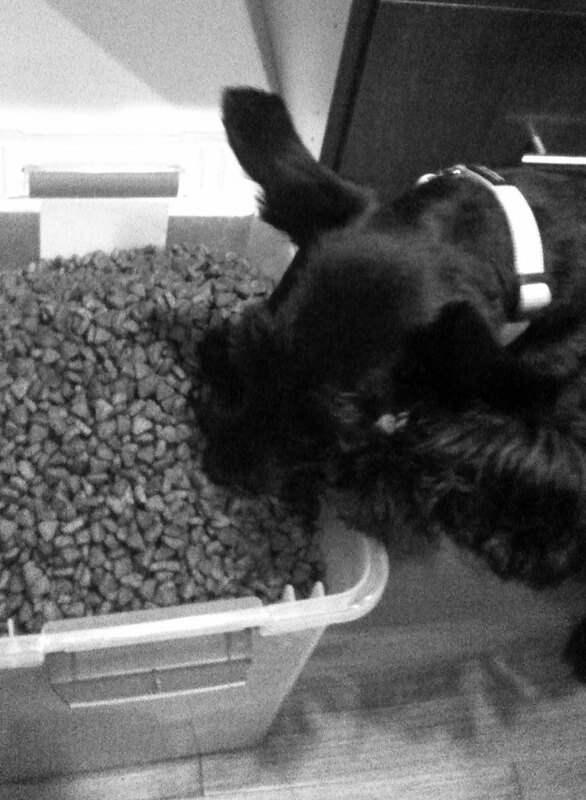 Does your Scottie have these kind of issues? If so, have you figured out ways to prevent them or lessen the number of occurrences? Before Scottie Dad traveled, it seemed simple time and patience were keys to the solution. Now, everytime Scottie Dad comes back, it is as if we are starting the whole trusting process from scratch...over and over. And until we find something to help ease my little girl's anxiety in this situations she's with Scottie Dad, I guess there's only one thing I can say: when it rains, it pours. Savor the moment, my precious pups, as tonight will be your last night to take over the hooman bed for a while. Scottie Dad is finally coming home after having been gone for two weeks and I suspect he won't be pleased to find you in *his* bed when he comes home. 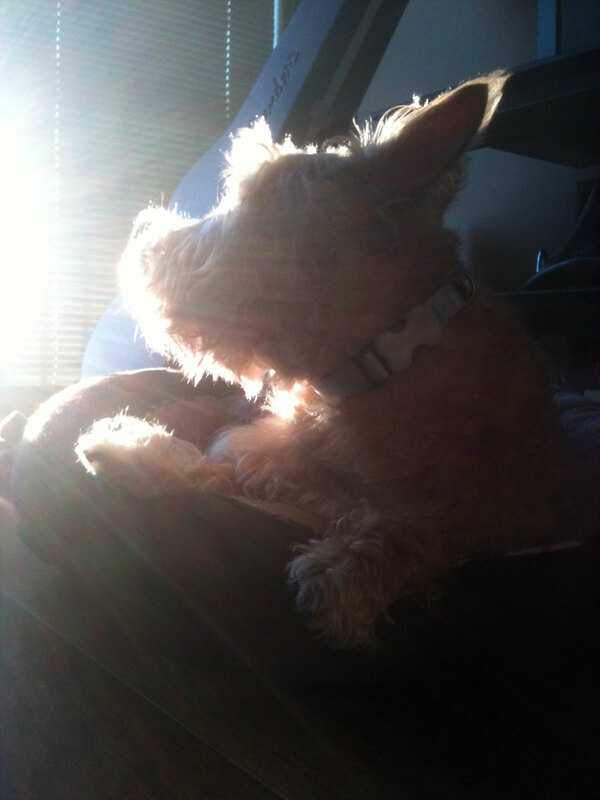 It's been fun waking up to your infectious good-morning smiles and happy tail waggings. Personally, I can't think of a better way to be woken up every morning but, for the time being, we'll have to resort to the click-click-clicking of your sweet paws hitting the hardwoods as you walk toward the bedroom door to say hello every morning. Rest assured, we'll have plenty of fun together this weekend in a charming place called Charleston, South Carolina...I hear we may be able to sneak midnight Scottie cuddles there. If not, well, I guess business is just going to have to call on Scottie Dad again soon! Can you roll your tongue? Mr. K can. It's just one of his many hidden talents. See? 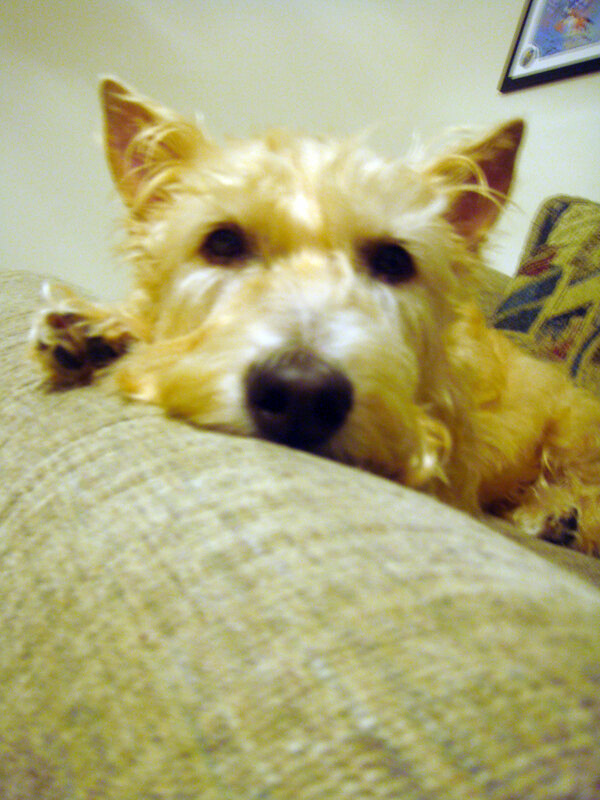 That's why he's not saying much this BlogPaws' Wordless Wednesday. What other special tricks or hidden talents does your dog have? Happy Wordless Wednesday, friends! Scottie Dad warned me it would come to this someday. I refused to believe it. My Scotties love to cause occasional havoc by dragging undergarments out of the laundry bin but they've never taken an interest in shoes, which is great because I often keep an assortment by the front door for convenience's sake...until now. The other day, I came home from work and hooked Heather and Mr. K up on their leashes for their afternoon walk. I stopped at the door to switch out my heels for something a little more comfortable when I notice one of my go-to flats for dog walking is missing. I look up and down the hallway. Not there. I go back to the living room and kitchen. Not there, either. Where could it be? Not wanting to keep my puppies from their much-anticipated walk any longer, we ventured out of the apartment without attempting to solve the case of the missing shoe. Heather and Mr. K were doing their business when it hit me: could one of my puppies have stolen the shoe? They've never done that before but they do love to keep me guessing...I smiled. Well, at least they chose the crappy shoe if they did! We headed back toward the apartment after their walk and while they ate their dinner, I decided to look around the apartment once more. At first, I saw nothing. 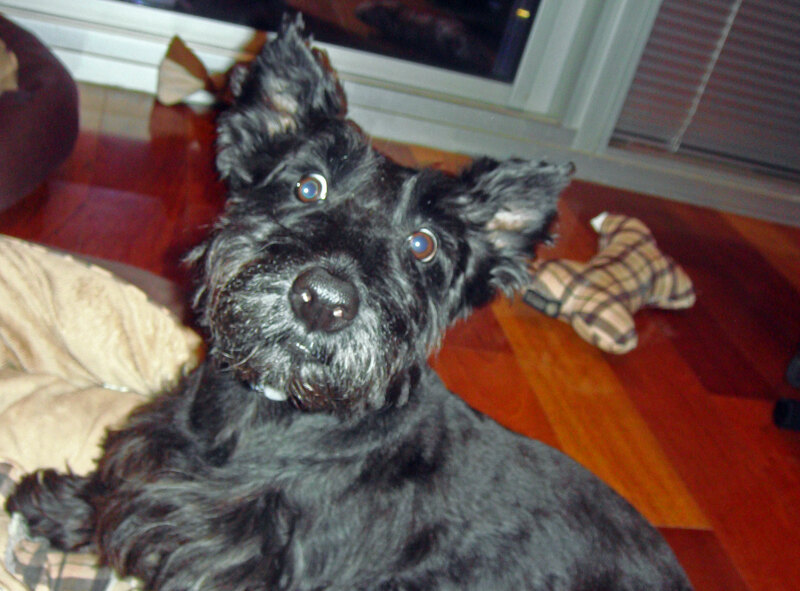 Then, I saw a shiny, black something in the Scottie bed: my shoe! I couldn't help but laugh. Why in the Scottie bed? To play with it? To chew it? To cuddle with it? Luckily, there weren't any chew marks. One of them must have picked it up for fun, ran off with it, shook it around and finally dropped it in the bed. But which was the Scottie Who Dunnit? I have a fair hunch which of the two it was but I'll let you tell me who you think is guilty here: Heather or Mr. K? ...or so Mr. K says. It bounces high and it bounces low. It keeps you on your toes, never knowing where it might lead you next. It takes you far and wide, but also compels you to come back to the people and places you left to chase it. Most of all, it makes you work before you are rewarded with the sound of the much-anticipated squeak. 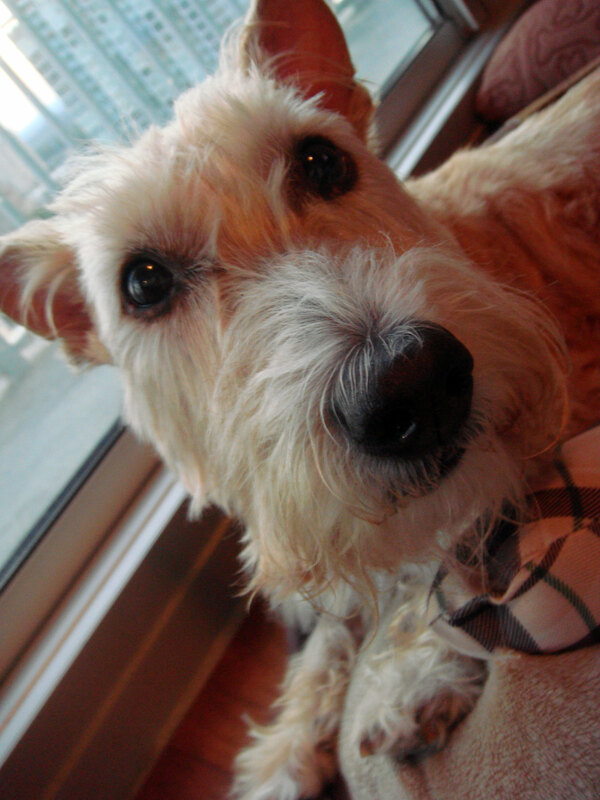 Think about it: the squeaky tennis ball won't squeak itself. Didn't your Scottie Mom ever tell you that? Oh, but once you get it to squeak, all the hard work and the running back and forth in pursuit of your dream of catching that squeaky tennis ball is instantly worth it. The sense of joy and accomplishment can be overwhelming at first but savor the moment, as the best moments with the squeaky tennis ball are often fleeting. You just never know when that squeaky tennis ball is going to take you on another wild adventure! Ever have one of those moments when you overhear a conversation and someone says something so out of this world that you can't help but back away a bit and give them the crazy eye? Mr. K just did. 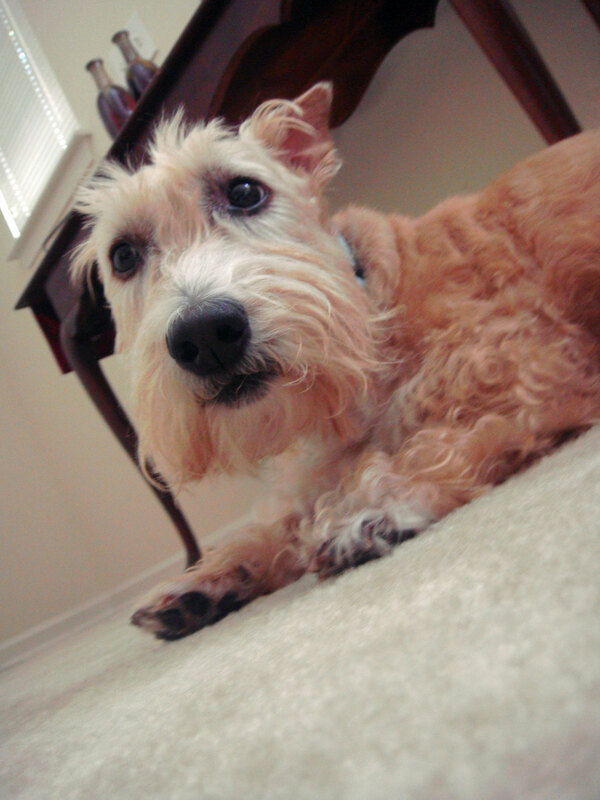 In fact, he's been stunned into silence this BlogPaws' Wordless Wednesday. What do you supposed he overheard that sounded so crazy it rendered him speechless? Happy Wordless Wednesday, friends! I hear the noise. My ears shoot up. She's got my attention now. That's the distinctive rustling of the almighty bag which contains...FOOD! I hop off the couch, run to find my Scottie Mom. Heather's on her way, too. Are we being fed twice tonight? Did we do something extra special to deserve such a glorious late-night feast? There's Scottie Mom. She's cutting open the bag. It's a really, really big bag this time! I can smell the yumminess already. Hurry up, Scottie Mom - I want some! Hey...she's not pouring it in my bowl. All the food is going into a bin. What's going on? Why isn't she filling my bowl? Hey, hey you! I want some kibble!! She tosses a piece of food my way and another at Heather but she keeps filling the bin. Why isn't she filling my bowl? Surely, she must know this is torture. What Scottie Mom would tease her pups in such a way? Maybe if I sit still, look innocent and act politely, she'll give me just a bit more. Wait for it...wait for it. Drat, still nothing. I shift my paws. Let her know I'm impatient. Just one more, please. Oh! There she goes - her hand is going for the giant bin of food. She's gonna scoop up a handful and put it in my bowl...I just know it! Wait for it...wait for it. Oh, come on Scottie Mom! The food does not need to be spread out evenly, I'll gladly eat it the way it is. The bag containing the scrumptious yummies is empty. She's folding it up now. Oh, can't I at least get a sniff of the bag? I'm sure it smells just as good as it tastes. Where are you going with that bag, Scottie Mom? Come back! Wait...she's taking the bag to the other side of the kitchen. That means...gasp! I turn around, there's Heather with her nose over the top of the bin. Darn, that girl is smart! I hurry back to the bin. Scottie Mom knows what I'm up to and says, "No!" I slow down, making her think I stopped moving and slowly crawl my way back to the bin. Heather's backed away. She doesn't like to be told, "No!" twice. That's it! It's all mine, now! I put my front paws atop the large bin and I bury my snout in the glorious food. Utt oh, she's back. I can't stop. I must keep going. She tells me, "No!" again. Should I listen? I can tell Scottie Mom's not very pleased with me. What did she expect? Now, she's laughing at me and...oh, what's that? Nooooo...she's picking me up and taking me away from the goodie bin. She puts me down on the couch and I smack the goodness off my lips. Where's she going again? Oh! She's back at the bin, petting Heather and giving her free kibble! Not fair!! I had to work for mine! I dash off the couch and sit expectedly at her feet, ready for my fair share. It doesn't come. Heather gets another piece of precious food. I shift my front paws to let Scottie Mom know I'm displeased. She laughs again and tells me I've had my fun and Heather gets rewarded for being such a good girl. And then, she pulls out the really, really good stuff: the bacon flavored treats! 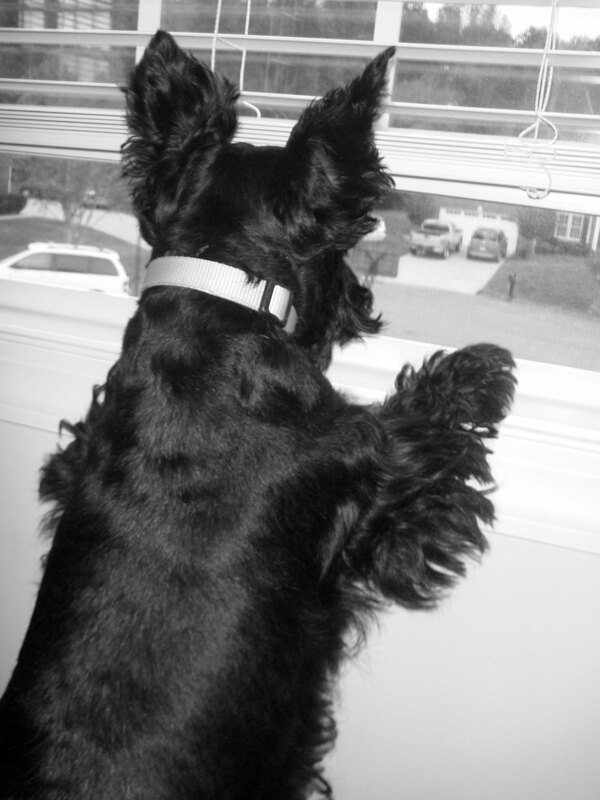 Scottie Security patrol men on duty. Syd and Mr. K on alert for any suspicious squirrel activity. 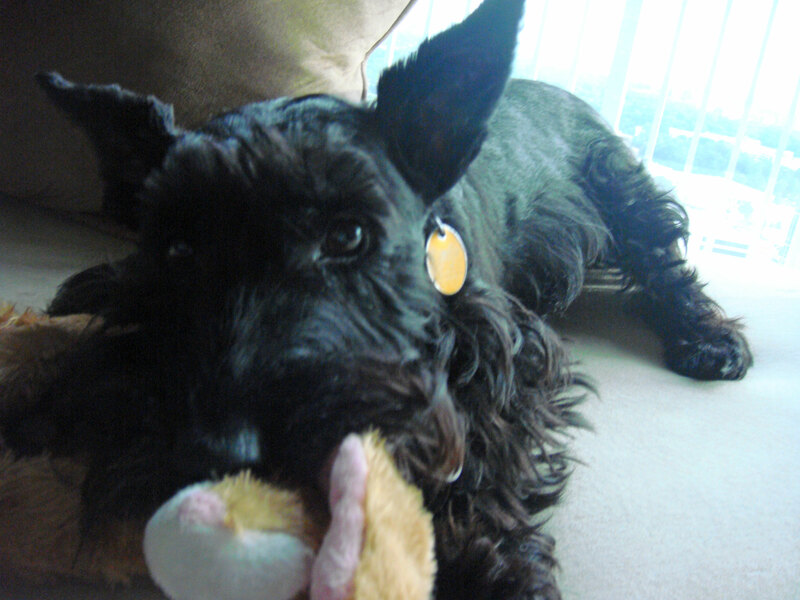 Syd posing for a photo for his Scottie Mom. Oz has a great smile, doesn't he? Hanging with the boys isn't so bad. Heather and Mr. K just couldn't wait for play day Sunday to have some fun this weekend. 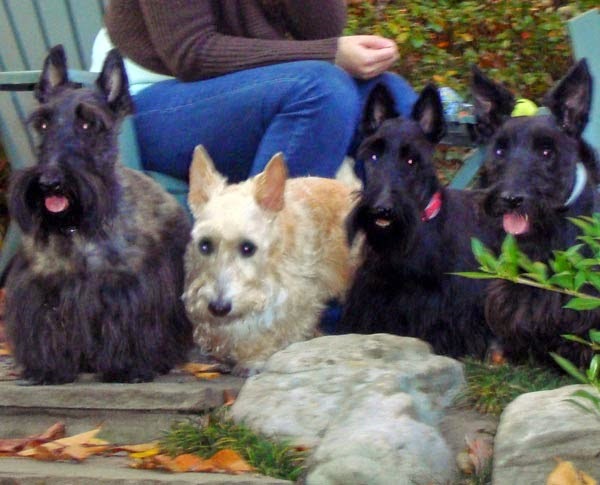 So, we all packed into the car and went to visit our good Scottie friends Syd and Oz yesterday. 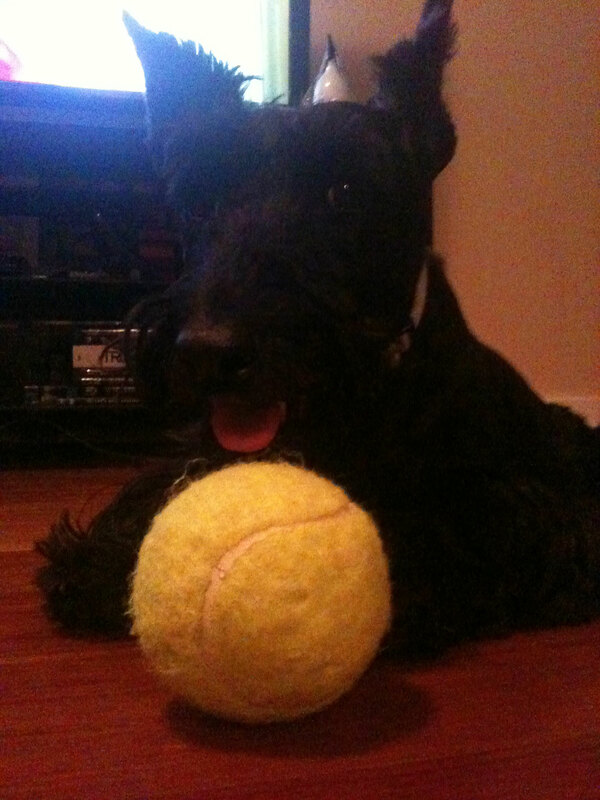 It was a great Scottirday filled with chasing squeaky tennis balls, patrolling the yard and even - you guessed it - TREATS! (Football-shaped ones for the boys and a martini-shaped treat for Miss Heather Beather. We figured she could use a 'drink' after putting up with the boys all afternoon). I'm pleased to say Heather decided to be much more social this time around and she didn't warn Syd or Oz once while we were there. She even dared to trot around the yard a bit but I noticed she always came back to score some love and attention from her Scottie Dad. Only in town for a few days, Scottie Dad was sure to shower his little girl with all the petting and back rubbing she wanted. It was so good to see her so happy and energetic - every couple of minutes, it seemed she was putting her front paws on his legs to get his attention - little girls certainly can be spoiled by their Scottie Dads, you know. Syd and Oz were adorable as ever. They even got a case of the zoomies at the same time as Mr. K and everyone watched in awe at how fast they were going through the bushes and leaves. Mr. K was a bit of a squeaky tennis ball hog but Oz was happy to watch. Syd eventually found another ball to run around with (which Mr. K also tried to claim for his own) until Scottie Mom intervened by taking all the squeaky tennis balls throwing them for the boys to chase after. I think it is safe to say all four Scotties slept straight through the night and then some after such an active and playful Scottirday. Many thanks to Syd, Oz and their Scottie Mom and Dad for being such fabulous hosts! For centuries, hooman men have been trying to figure out what hooman women want. Heather doesn't think it's really all that hard to understand. In fact, she suggested that all a hooman man has to do is take a lesson from the female Scotties in his household. So, fellow Scottie Moms, pass this list of things a (Scottie) girl wants along to the Scottie Dad in your household. Perhaps Heather can help him pick up on a thing or two! 1. First and foremost, to be loved and cherished. 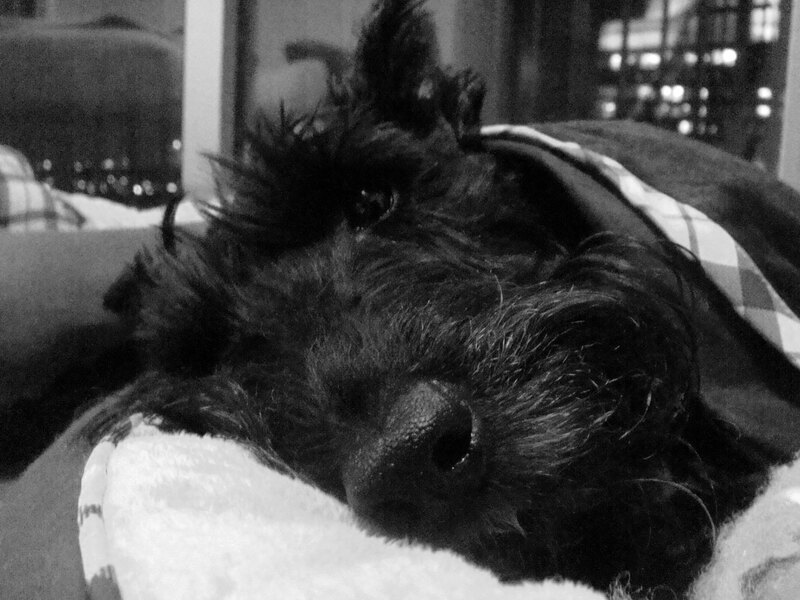 A Scottie girl needs to know you care for her as much as she cares for you. Do not fear showing your feelings and be generous with your kisses! 2. R-E-S-P-E-C-T. 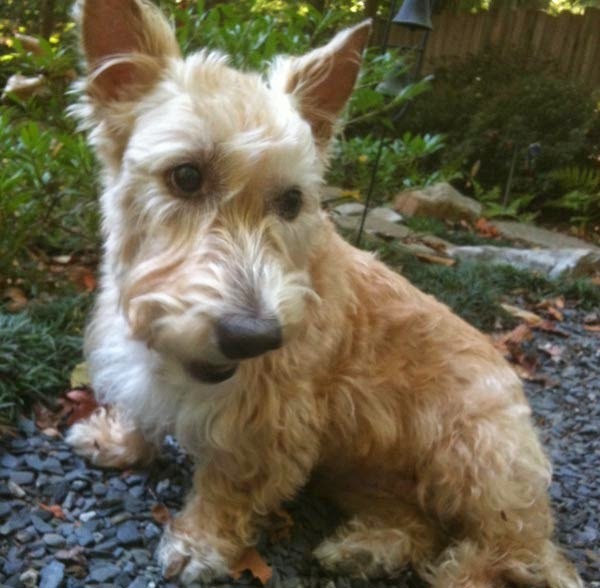 In addition to being loved and cherished, a Scottie girl needs you to show some respect! After all, she is an independent woman who can hold her own. 3. Your time and attention. It doesn't always have to be long walks on the beach, you know. 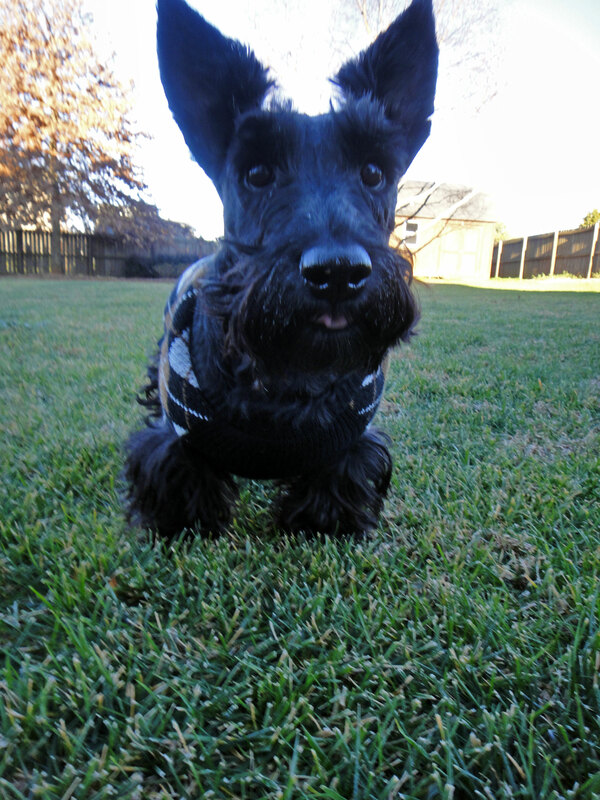 In fact, a Scottie girl would much prefer long walks in the park! Cuddle time afterwards is a must. 4. A quiet place all to herself. Every once in a while, a Scottie girl needs to be on her own in a peaceful place for some "me" time and reflection. 5. To be pampered. Can anyone say full-body massages, maybe unlimited back and belly rubs? Oh yeah, treats are good, too - especially the gourmet ones! Ok, Scottie Dads - I've let you in on a big secret here. 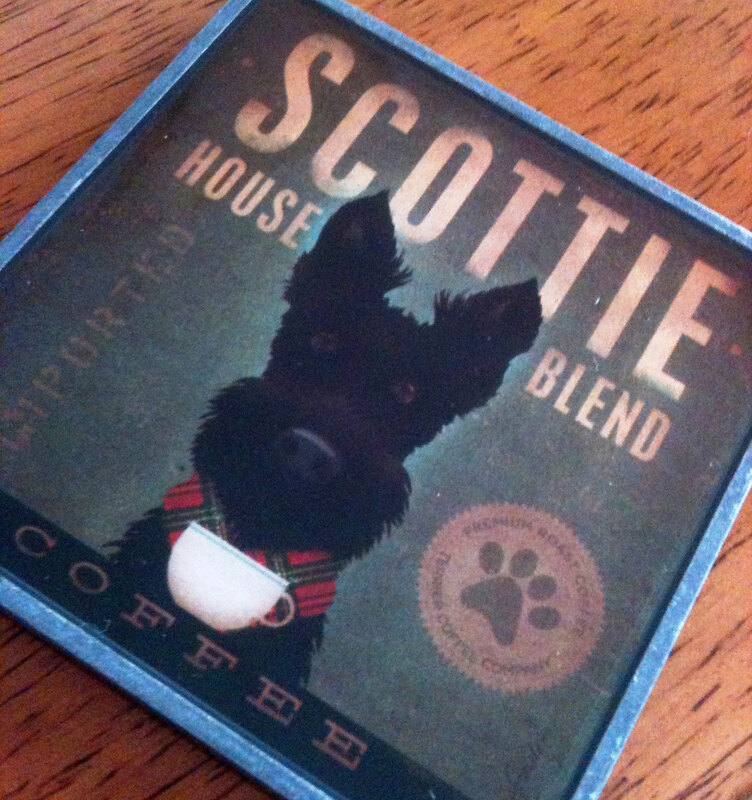 Now you have no excuse to not know what a Scottie or a hooman girl wants. Don't you take our love for granted, now...go forth with these words of age-old Scottie wisdom and do some good. Yours truly, Miss Heather-Beather. 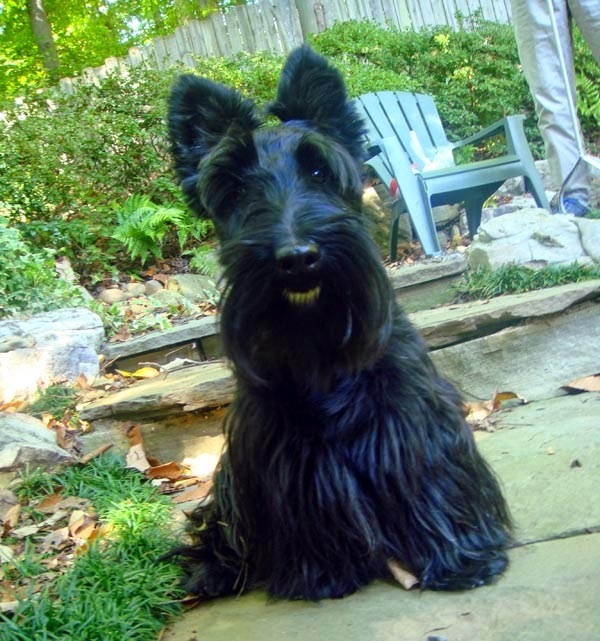 According to the American Kennel Club, the average Scottie weighs between 18 and 22 pounds. When I first met my darling Heather, I knew there was a strong possibility she was outside that weight range but it wasn't necessarily because she was overweight. She was, much to my surprise, bigger than my Mr. K both in terms of height and length. I had been told by the shelter I adopted Mr. K from that his previous owners mentioned something about him being the runt of his litter. It wasn't until I saw Heather that I began to wonder whether Mr. K was really that small or if Heather was really that big. When I got her home and later took her to the vet, I discovered Heather tipped the scale at just over 27 pounds. That seemed a little high for this Scottie Mom's comfort level. When I adopted Mr. K a year prior to, he was only 17 pounds and the vet said he could afford to put a few more on. How very different the two were! 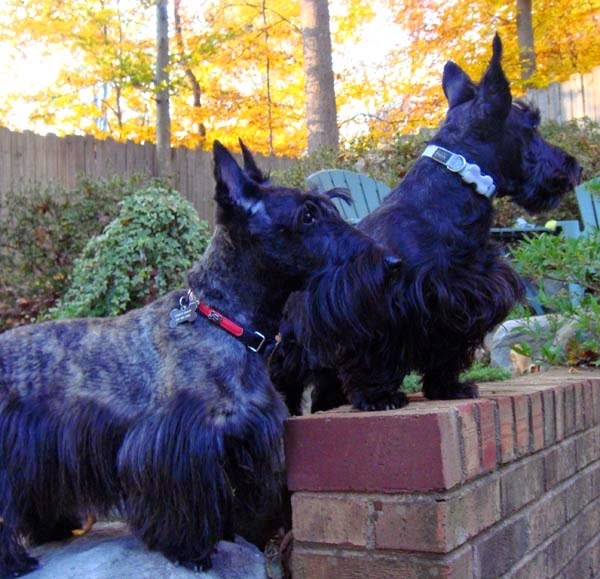 And so, this Scottie Mom set out to making sure each of my babies was the healthiest weight they could be. It was easy getting Mr. K to put on weight and nearly three years later he's up to about 23 pounds, looking as strong and healthy as ever. Ideally, I'd like him to stay around the 22 pound weight and we're working on losing that extra pound. Heather, on the hand, has had a harder time. (Don't all women have this struggle?) She lost a good two pounds in the first year or so but hasn't really been able to go below the 25 pound mark. I'm thinking that might be okay, though, because she certainly doesn't look overweight since she's a little taller and longer than Mr. K is. Losing those two pounds has really made a difference...to me, at least. But strangers and neighbors don't know Heather's full story. They don't know just how far she's come in the year and a half I've had her. Consequently, nothing upsets this Scottie Mom more than to hear these complete strangers go, "Wow! She's biggg!!" I also often hear, "That's a SCOTTIE?!" I used to think people were referring to how different the color of her coat was because it is a question I get quite often. Then, one day, a not so subtle neighbor took one look at Heather in the elevator and, without so much as acknowledging the wildly wagging tail and the happy-go-lucky face staring up at him, he said: "Man, she's a BIG one, huh?" I looked at him, face all scrunched up as if to say, "excuse me?" Lucky for him, the elevator arrived at his floor and he was on his way before this Scottie Mom could tear into him. 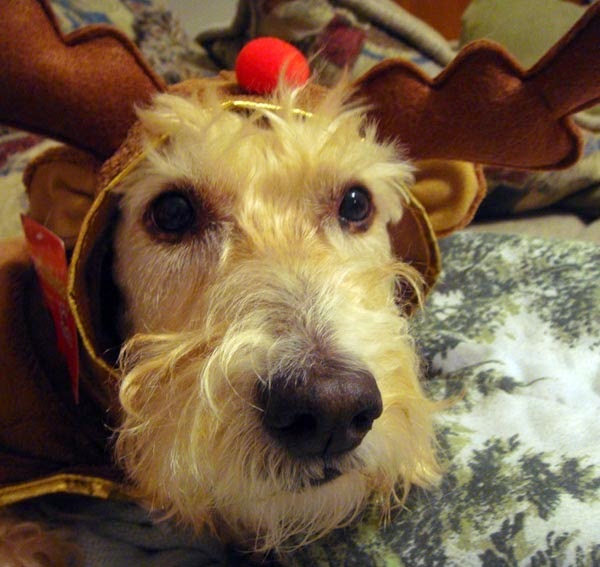 A few words for the wise: NEVER insult a fur-child in the presence of his or her mom. It never ends well for the other person. That particular neighbor might have been the first but, unfortunately, he certainly wasn't the last. I've had a number of people (all men, ironically) make comments about her size. Now, when I see those neighbors whose eyes stayed clued on her, I find myself wondering: are they trying to figure out whether she is a mixed breed or are they thinking she's just fat? Occasionally, I'll get the "Wow! 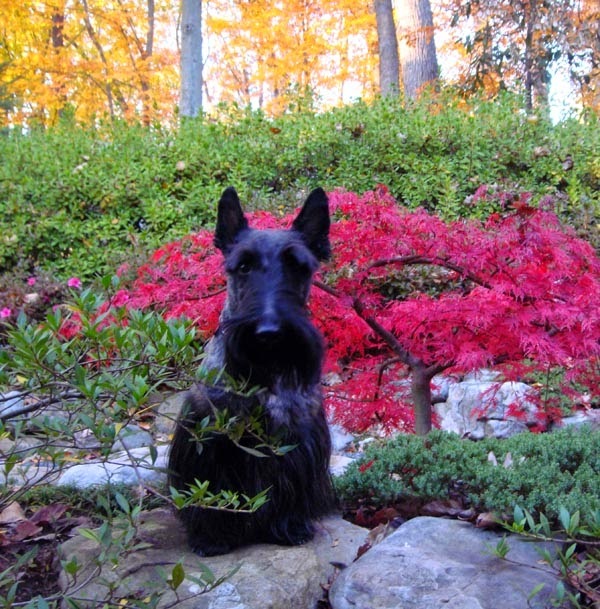 I've never seen a Scottie her color before!" and I immediately feel relief. My hope is that these strangers and neighbors are just taken aback by how beautiful she truly is and loving her for that extra friendly personality of hers. It is a shame for those who make a snap judgment and assume she's overweight. Truth is, the vet is happy with where she's at in terms of her weight now and frankly, so am I so don't you dare call my Scottie fat! 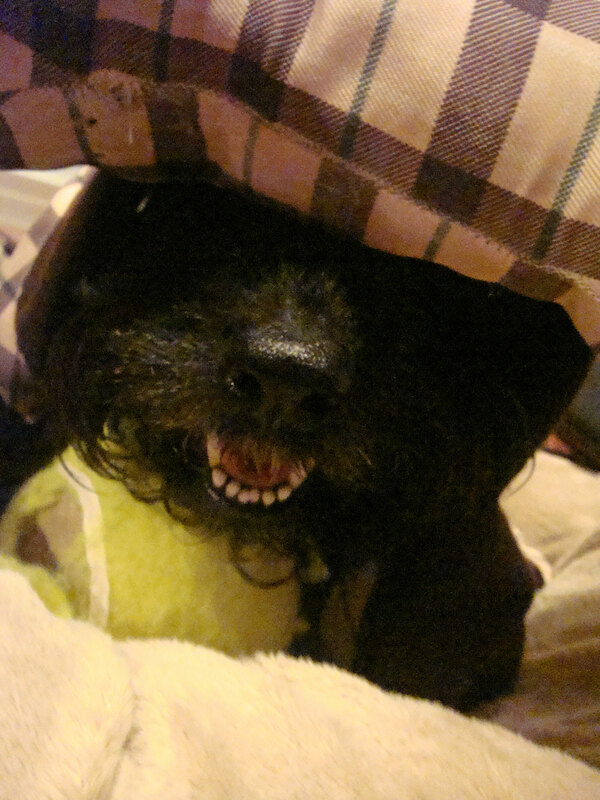 Mr. K's got his mouth full this BlogPaws' Wordless Wednesday so don't expect him to say much! He's using all his strength, courage and determination to defeat the thief who almost got away with stealing his squeaky toy. Who could commit such a crime against humanity's best friend? Obviously, he couldn't let that happen so he grabbed as much of the toy as he could in his mouth and is holding on for its dear life. Who will comes out on top in this epic battle: Mr. K or the thief? Hi, I'm Mr. K and I've decided that no matter what the outcome is of the U.S. election, I'm going to appoint myself as president! 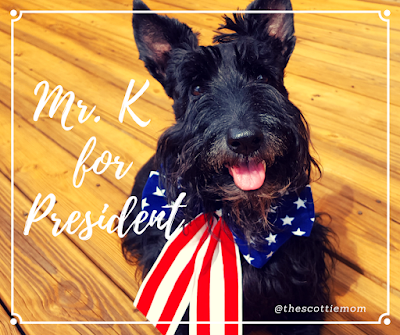 (I'm sure all my new friends would approve...besides, we Scotties have lived in the White House more times than any other breed so why not have one live there who's actually president?!) Now, this may come as a shock to those of you watching CNN. They haven't broken this very important news yet, but give it time. You'll see. For those of you wondering what my platform is and what my game plan entails over the next four years of my self-appointed presidency, see below. Your feedback, my fellow canine Americans, is always welcome. 1) Declare Friday a Day of Playing in the Park and every third Tuesday a "National Treat Day." 2) Feed the hungry and shelter my fellow animals in need. 3) Get rid of kill shelters and formulate an incentive plan for owners of safe and loving homes, encouraging them to adopt. 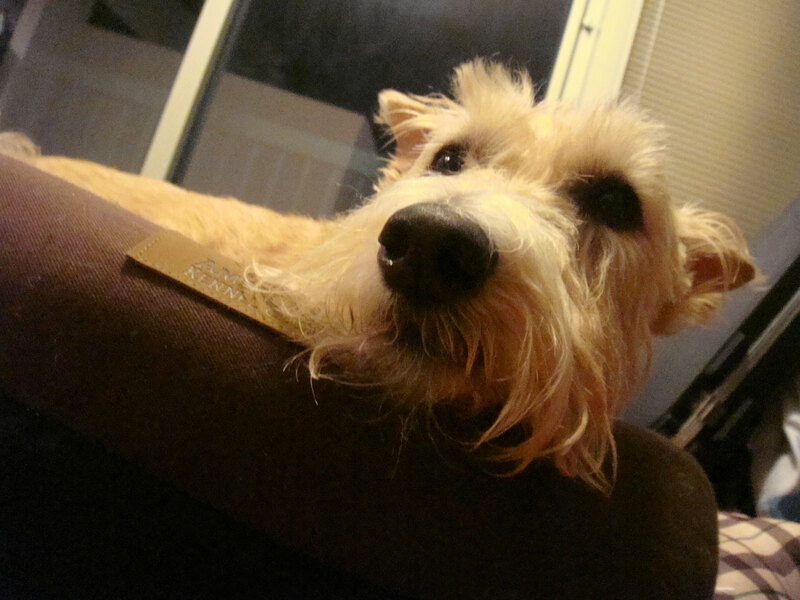 5) Promote good health by asking my furry friends to get yearly annuals and be proactive about their health. (Think: Extra walkies!) I'll also be looking to sit down with the V-E-T-S for a serious discussion on putting a cap on the fees they charge as well. 6) Matters of national security are no problem for this president. 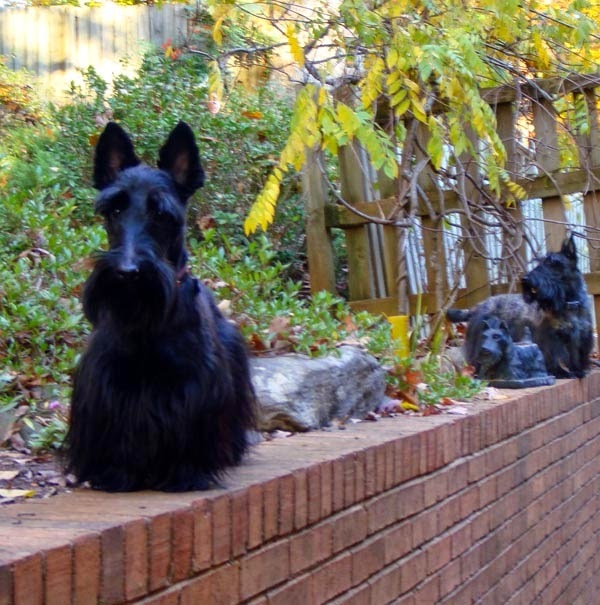 I'm bringing in Scottie Security (with a few Rotties to serve as backup!). 7) Toughen laws on animal cruelty. Anyone seen hurting a fellow animal or known to have abandoned or mistreated a furry friend will be sentenced to spend some time crated up in a shelter, so they can see how it feels. 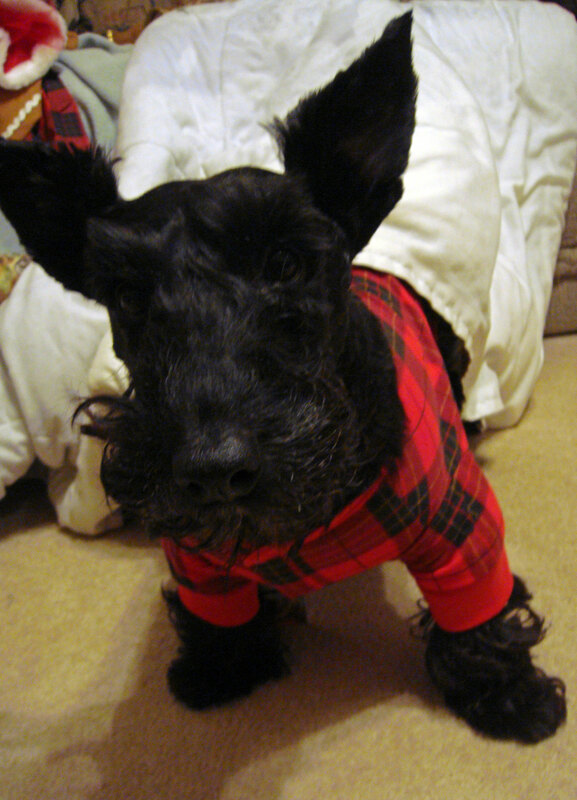 8) Make October 25 (my birthday) a national holiday celebrating the lives of every Scottish Terrier and the impact we've had on society. 9) Improve spay/neuter laws. Ok, I know canine friends will think I'm crazy but here's a great example: there are lots of those evil C-A-T-S. So much so, we're in danger of them taking over the world because they reproduce so much. Implement better spay/neuter laws, problem solved! 10) Oh yeah, and free belly rubs and back scratchings from humans for life for any canine that supports my cause! October was such a fun month in the Scottie Mom household - and we've got plenty of photos to show for it! Here are some that didn't quite make the cut the first time around but were so funny I thought they deserved a post of their own. Go ahead, laugh a little!